Japanese knotweed leaves are arrow-shaped and attached to stems in a zig-zag pattern. If you’ve recently been along the Rideau River pathway from the Queensway underpass to the pedestrian bridge at Somerset Street, you may have noticed some copses of a bamboo-like plant among the assortment of river-edge trees and shrubs. No, climate warming is not bringing us tropical bamboo; this is Japanese knotweed, among the world’s top 100 invasive species, according to the Global Invasive Species Database – an online resource maintained by the International Union for Conservation of Nature (IUCN). Japanese knotweed is native to eastern Asia. It was intentionally introduced to North America in the late 1800s and has been planted widely as a garden ornamental and for erosion control and livestock forage. It is now recognized as an aggressive invasive species in Ontario and elsewhere in North America, Europe, Australia, and New Zealand. What makes this plant an unwelcome alien? Its bamboo-like canes form dense thickets, outcompeting native plants and invading wetlands and river banks. This plant spreads easily via wind-dispersed seeds and underground stems (rhizomes) that can break through asphalt and tiny cracks in concrete. The insect predators and pathogens that keep it under control in its native habitat are absent in the places where it has become invasive. The flowers and leaves of dog-strangling vine resemble the common milkweed host of monarch butterflies.apartments and the river bank. 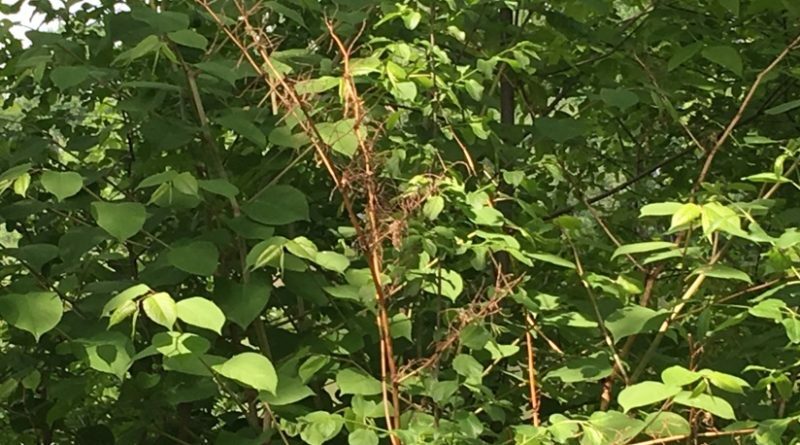 Japanese knotweed is also invading private properties in Sandy Hill – for instance, it fills the back garden of at least one house on Sweetland Avenue, and persists along the side of a house at the corner of Russell Avenue and Somerset Street East. apartments and the river bank. 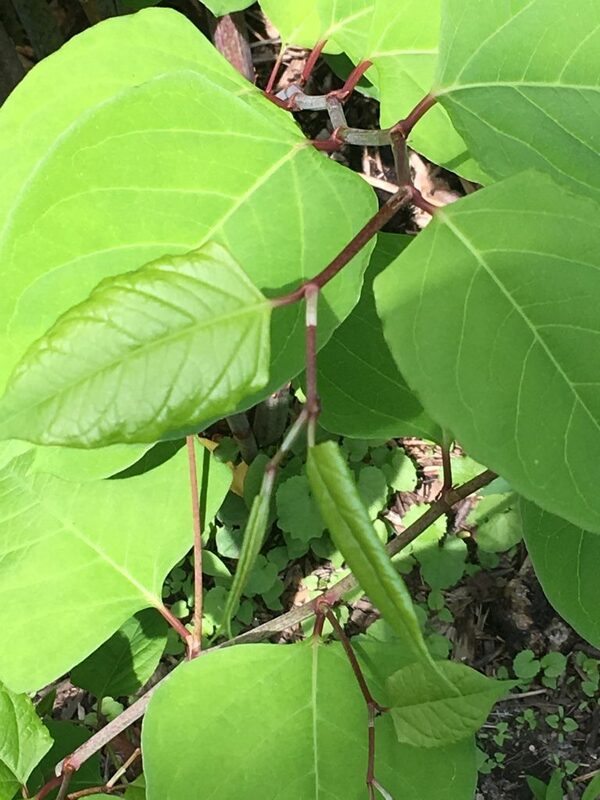 Japanese knotweed is also invading private properties in Sandy Hill – for instance, it fills the back garden of at least one house on Sweetland Avenue, and persists along the side of a house at the corner of Russell Avenue and Somerset Street East. In the same survey I also identified an alien plant that has become very invasive in the Ottawa region – dog-strangling vine. This plant was introduced to North America from its native habitat in Eurasia to Ottawa’s Central Experimental Farm as a potential source of natural latex and as a garden ornamental. It’s aggressively invasive habit was discovered too late to prevent its spread to other parts of Ontario, Quebec, and the Northeastern United States. The plant doesn’t actually strangle dogs (as far as I know! ), but it does form large thickets of intertwined vines that “strangle” and out-compete other plants. Eradicating, or at least controlling the spread of these invasive species is important to protect the diversity of native plants, but also to protect other native species we appreciate. Dog-strangling vine, for example, is related to the common milkweed that is essential to the existence of monarch butterflies – now considered a threatened species globally. When monarch adult females land on a dog-strangling vine leaf, chemical sensors in their feet detect the presence of the same chemicals that make common milkweed a nutritious host for monarch caterpillars. They lay an egg on the underside of the dog-strangling vine leaf, but when the caterpillar emerges to eat that leaf it is not nutritious enough for the caterpillar to survive. Remove the above-ground parts of all the plants, large and small, before the flowers produce seeds. Continue to do this every year (it may take 5-10 years of active control). Mulch and seed or re-plant large affected areas with native species able to outcompete new growth. Check the “Grow Me Instead” guides available from Ontario Invading Species Awareness Program and the City of Ottawa (see “Some resources” below). An organized city-community effort could get this done. 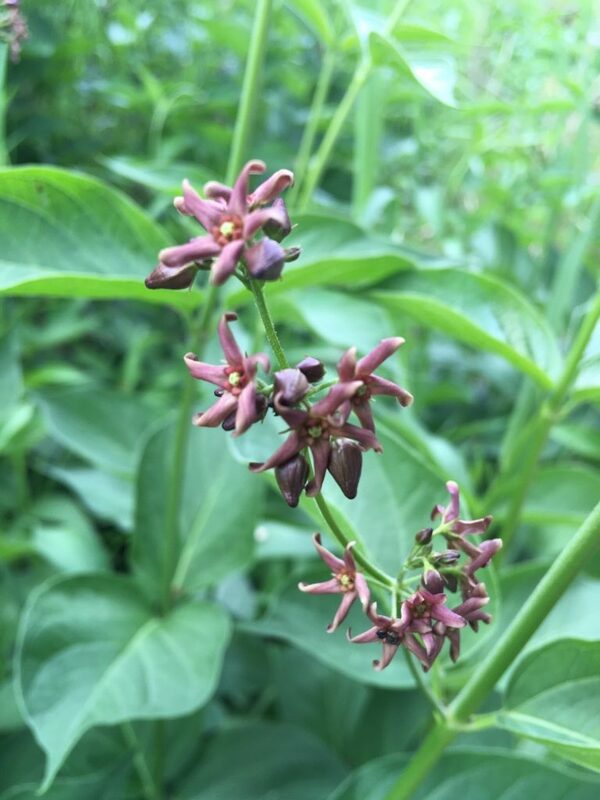 Neither Japanese knotweed nor dog-strangling vine appear to be included among the invasive species actively monitored by the City of Ottawa, the city’s Invasive Species webpage includes Japanese knotweed among garden plants to avoid. Report any new sightings of these invasive plants to Ontario’s Invading Species Awareness Program (see below). Guidance available online includes “Best Management Practices for Dog-strangling Vine (Vincetoxicum rossicum)” and “Best Management Practices for Japanese Knotweed (Fallopia japonica)”.